Cette cabine est correctement nommée True Grit! Il dispose de toutes les caractéristiques et commodités que l'on peut attendre d'un design ultramoderne et d'une cabane en rondins faite à la main. Le décor est neuf et moderne, mais la propriété est rustique, confortable et bien aménagée! Accès facile au coeur du village de Shotgun. La motoneige est incroyablement simple à partir de cette nouvelle cabane en rondins. Zip au coeur de Shotgun pour Jefferson Access, ou descendez l'un des sentiers damés pour vous connecter à votre prochaine aventure. Bien que situé à moins de 26 km de l’entrée ouest de Yellowstone, son emplacement est idéal pour explorer à votre guise. L'intérieur de la cabine impressionne avec sa bûche artisanale et ses plafonds inclinés en bois, ses grandes baies vitrées et son intérieur bien aménagé. Vous vous sentirez comme si vous êtes entré dans un pavillon assez confortable pour toute la famille. Une abondance de commodités en peluche fournit des sièges confortables pour regarder la télévision à écran plat ou passer votre temps à vous détendre dans un environnement ouvert. Vraiment sortir de tout cela dans cette belle cabane en rondins haut de gamme qui ressemble à votre propre loge personnelle. Situé dans la nature vierge de l'Idaho, vous aurez des pistes de ski de fond, de motoneige et de VTT à votre porte. True Grit Adventure dispose de deux chambres, un canapé-lit et est idéal pour les familles, les amis ou les couples voyageant ensemble qui veulent une expérience en plein air magique sans distractions modernes. Les deux chambres, y compris la suite principale, accueilliront confortablement six personnes. Une chambre a un lit queen et l'autre est un roi. Le salon principal comprend un canapé convertible très confortable, un coin salon serein et des fenêtres audacieuses et lumineuses avec vue à 360 degrés. La cabine comprend également une laveuse et une sécheuse pour vous aider à nettoyer après une journée d'aventure. L'été donne accès aux sentiers de VTT, à la pêche à la mouche locale, et pour ceux qui veulent un peu plus d'aventure, il y a même quelques ours et orignaux dans la région. La faune est abondante! La randonnée et le vélo sont également des activités de plein air populaires, et il y a toujours la pêche et la navigation de plaisance sur le réservoir Island Park ou le lac Henry. Vous n'avez pas envie de cuisiner? Vous trouverez des restaurants à proximité, notamment un restaurant gastronomique et un pub. Essayez le Trout Hunter, Boondocks, ou les Pins pour de la bonne nourriture et de l'ambiance. Cette belle cabane en rondins est la relaxation ultime. Cette propriété est chien amical (max 2)! Si vous apportez un compagnon ou deux, veuillez noter qu'il y a un frais supplémentaire de 45 $ par animal. S'il vous plaît envoyez-nous une note nous informant de votre intention d'amener un chiot, combien vous apportera, et les frais appropriés seront ajoutés à votre réservation. * Kabino est la seule entreprise offrant un service de poubelle GRATUIT à ses invités! Réservez avec nous pour éviter de transporter vos déchets à la décharge! 1. There were no coffee filters. When we called for some, initially they said that they would bring some over next morning. When we insisted that we have some now, as we were leaving very early in the morning, they did bring some over, but they were of the wrong size and shape, resulting in coffee grounds in our cups. 2. One of the bedside lamps had a burnt-out bulb. 3. The living room fan would not work. 4. The bathroom hook fell off when we hung some clothes. 6. The aluminum grease tray on the grill had holes in it, resulting in grease dripping on the deck. 7. The extra sheets and blankets were crumpled up in a pile in the closet, instead of being folded. 8. There were no instructions for the T.V. 9. A can of cooking spray in the kitchen would be nice to have to make breakfast. Great, dog friendly place to stay while visiting Yellowstone, took us less than an hour to get to West Yellowstone. Clean and comfy, wish we could've stayed longer. Not sure if it was the cool air or the bed, but I slept great. A few neighbor dogs came over to visit with our pup while we were there which was an added bonus. This cute little place is in a great location to snowmobile direct from the house. The parking was very snug for 2 trucks and trailers, but we made it work. The description says "2 bedrooms", it's really 1 actual bedroom, and a bed in the front room with a small room divider. We loved the convenience of the location, how cute and quaint it was, master bed was very good size and the bed was very comfortable. The Kabino man was very friendly and came and picked up some trash for us. If I could change anything, I wish the cabin was a little cleaner when we arrived. Thank you for a wonderful review. We will follow up directly with you to see exactly how we can improve this property, and specifically how we could have helped. Our staff is available 24/7, including housekeeping, so we could have addressed anything that was missed upon your arrival. Thanks again for the feedback. Upon Arrival it was very dark outside lights were on and lock box was accessible no problems there. Upon entering the property it was very musty smelling but it quickly left as we turned on the heater. 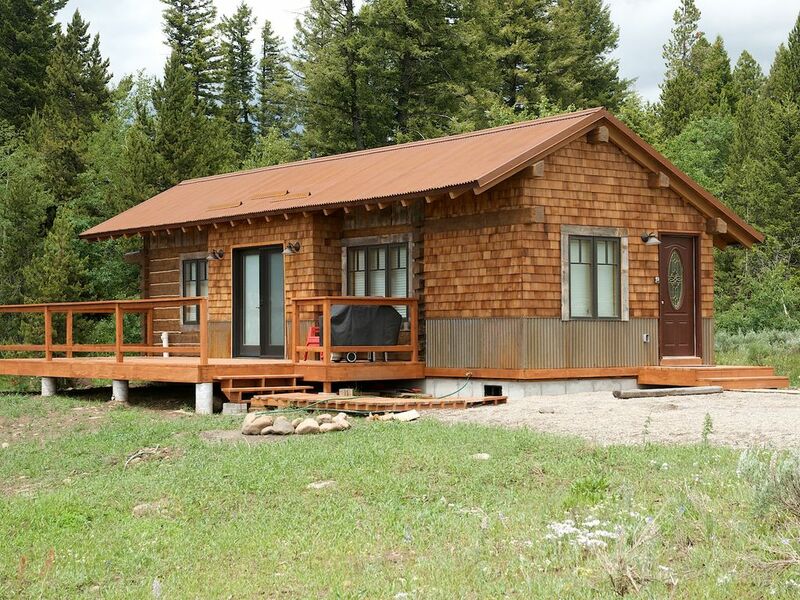 At first glance we were impressed with the cabin and the bedrooms. The first bedroom is not fully private and is only a full size bed. It was perfect for us as we were just 3 but for 6 it would be a tight fit. The top of the fridge, Ceiling fans in all rooms, light fixtures, and bathroom fan and water heater area had not been dusted at all! Very Dusty even Italian Curtains in the bedroom and more dust where the linens are kept inside the bigger bedroom. The freezer was over run with ice that was spilled everywhere, we cleaned the ice up. There was a cracked piece of plastic below microwave door. The stools used for dining 2 of them were loose and dangerous to sit on I flipped them over and tightened hand tight. Furniture, stove, and fridge had clearly not been moved for deep cleaning. Large bottom bedroom bed posts are loose. The outside area was not kept and was overgrown, perhaps this is normal for the time of year. The property rental name represented on site was Peak Property Rentals. My message to them is FIRE your cleaning crew! The charge is 100.00 cleaning fee surly as you see in past posts this still is an issue and has not been addressed. The Cabin has its warm charm We loved the location and the full kitchen was great to have for cooking in.This was my first rental and now I know what I will do when I use this service again I would rent this Cabin again. I will make full use of contact with the property manager and set expectations on the front side. Locals overseeing the property need to do there part and find the right cleaning crew and address other issues that could prevent people from having a good stay. We are very glad you enjoyed the property itself. Had we known there was a housekeeping issue present, we would have sent housekeeping staff over immediately. Please call us anytime. Our staff is available 24/7. Based on your feedback, we'll be reviewing our policies and housekeeping checklist on this property. Thanks again for your feedback. While the little cabin was cozy and inviting, it was not as clean as we would've liked. The cleaning charge was $100 and the renters and possibly the property manager were not getting their money's worth. The bathroom fixtures had not been cleaned in months and the furniture had not been moved to clean in many months as well. Still the stay was pleasant and I will give the property 4 stars. Thank you for your review and feedback. We have sent our head of housekeeping to address and improve the property based on your suggestions. Thanks again for your feedback.